To celebrate baseball and sing the national anthem for more than 100 minor league baseball games during a single summer, Joe Price drove more than 25,000 miles through forty states. Accompanied on the zig-zagging, cross-continental trek in an RV by his wife who had not been a baseball fan, he often shared games and baseball stories with relatives and friends along the way. Serendipitously in multiple ballparks across the nation, Price met college alumni and former Whittier residents whom he had not previously known. Throughout the journey he experienced how baseball brings people together. Grounded in their respective communities, each ballpark reflected specific products, habits, and values associated with its location, and often evoked and formed distinct baseball memories and stories. Some provided high drama with walk-off home runs, others featured bungled plays on the diamond, and a few celebrated outlandish promotions for fans' entertainment, like the antics of BirdZerk in Fort Wayne, the flight of the first human home run in Lowell, and the crooked race by armadillos in Tulsa. 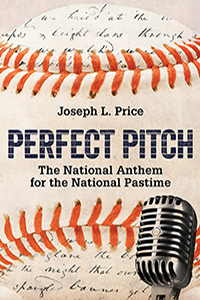 Blending baseball lore, travel narrative, and personal memoir, PERFECT PITCH explores America through a lens of minor league baseball as it chronicles Price's anthem adventure. The book includes more than fifty photographs and maps.